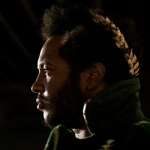 Bassist/songwriter/vocalist Stephen Bruner, aka Thundercat storms back with the follow-up the Flying Lotus co-produced The Golden Age of Apocalypse. Thundercat teamed up with executive producer Flying Lotus once again, to form a profound body of work for his second album, Apocalypse. Full of jazz influences that you'd expect with Flying Lotus, but also Bruner's father Ronald Bruner, Sr., is an internationally renowned jazz drummer who played with the Temptations, Diana Ross, Gary Bartz and Gladys Knight. The neo-soul of Heartbreaks + Setbacks is beautiful, Burner is on top form on the LP and I hope it will push his music to a wider audience. Each track offers something different, yet collectively works in harmony. The Life Aquatic is an instrumental of lotus beats and Burner bass. This track Oh Sheit It's X adds some disco pomp and funk guitars with a future-retro synths. Without You's skippy beats backsliding in and out of the bubbling melody is half ballad and half instrumental interlude, delightful. Burner pours blood, sweat and tears into this recored. A welcome return and Highly Recommended.